My wife loves to listen to her iPhone 5S as she does various things around the house. I love listening to my music on my smartphone while I workout or while I am at work to keep me motivated and possibly accomplish something before the day is over. We have an old Bose radio that has an auxiliary input where we can plug in our phones or tablets and get that great Bose quality sound but with the cable we are limited to the location of the Bose radio which isn’t where we are at the majority of the time. It is just too inconvenient and not worth the effort most of the time. So we needed something that is portable so that we can carry it to any room and has great sound. I started looking around and while we were in a Verizon store, upgrading my wife’s phone, I asked the sales associate what audio devices they had and which would they recommend. 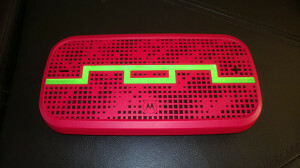 He brought over the Motorola Deck and started to demo it. He stated that all the sales associates use it in the store to listen to their own music from their various smartphones. They loved the quality of the sound, how loud the it could get, the fact that multiple devices could connect to it at one time and of course how portable it is. Well that was great but I needed to here some of my favorite songs so I could judge for myself. He connected my Nokia Lumia 928 to the Deck using the Tap-to-Pair feature and I started to play my music and was really impressed. So I went on ahead and purchased it. I love the great sound that it produces. It has really clear Treble and Bass levels that are well balanced and complements the music that my wife and I like. I can connect 5 different devices to it at one time. We have an iPad Mini, my Surface RT, iPhone 5S and my Nokia Lumia 928. Once they have all been paired, all you have to do is play any device through it. Heist Mode – in this mode any of the 5 connected devices can take over the speaker. This can be really fun at a party. During our Christmas gathering my son connected with is Droid phone and took it over from my phone. We went back and forth playing different music and had a lot of fun doing so. The portability. All we have to do is pick it up and take it anywhere in the house or outside of the house if necessary. The bar across the top has a color indicator to let you know which device is currently playing. This is only useful if you remember the colors that are matched to the device but I like it anyway. It has volume control buttons on the top and you can still control the volume from the connected device. It has the ability to connect to your phone and act as a wireless speakerphone. The M on the top can be used to make or receive a phone call using voice commands. To get this to work you will need to put it into Single User mode using the selector switch on the side. If I wanted more sound, I can connect the audio out jack into my Bose and still have wireless music muting the sound on the Deck. Overall, we really like this speaker. It was has a heavy price tag of $199 for such a small device but we think it was well worth it. Nice job Motorola!